Monday December 25 1911 It was a beautiful Christmas day. We went down to Otts. All got presents. Ott & Fannie gave me plates for my set and pictures of the boys & Father & Mothers [illegible] a plate. Mary Woolf dishes. Hattie a plant in a pot that was Mothers. Will came home to do chores and came after me. We had supper up home. The folks went to town to the wedding of Mrs [Borlocks?] daughter. Tuesday December 26 1911 It stormed all day. It stormed all day. I worked on the tatting for Ethel Dentons handkerchief she will be married the 6 of Jan. Wednesday December 27 1911 I was at the home all day. I did some sewing and finished the tatting for the handkerchief. Weather some better. 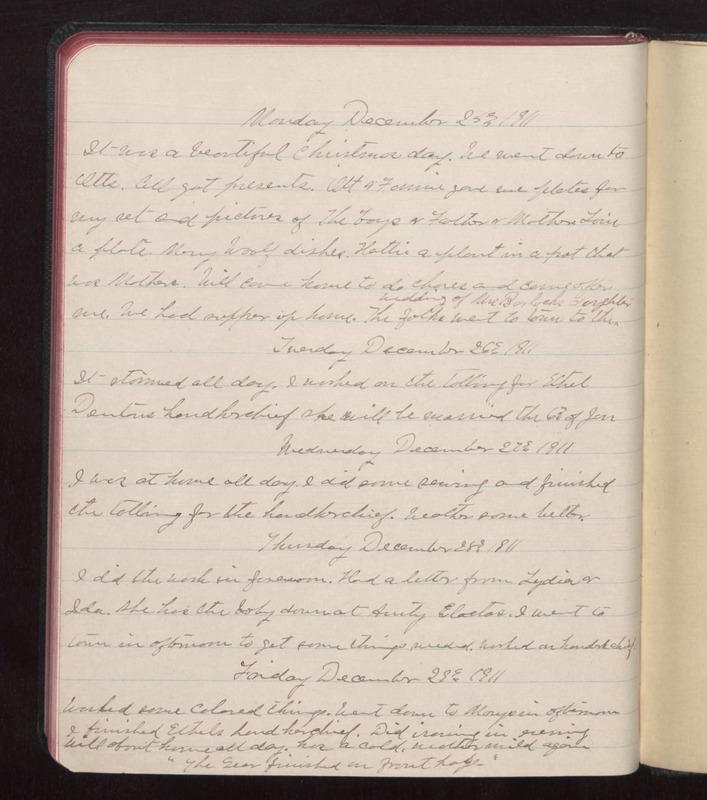 Thursday December 28 1911 I did the work in the forenoon. Had a letter from Lydia & Ida. She has the baby down at Aunty [illegible]. I went to town in afternoon to get somethings needed. Worked on handkerchief. Friday December 29 1911 Washed some colored things. Went down to Marys in afternoon I finished Ethels handkerchief. Did ironing in evening Will about house all day. Has a cold. Weather mild again. "The Year finished on front page"